The Monsters were defeated in overtime by the Utica Comets on Sunday at Adirondack Bank Center in Utica, NY by a final score of 5-4. With the overtime setback, the Monsters are now 24-22-6-1 overall this season and with 55 points, remain alone in sixth place in the AHL’s North Division standings. Cleveland grabbed a 1-0 lead on Sunday with a Doyle Somerby even-strength finish at 11:22 of the opening frame, thanks to assists from Dan DeSalvo and Dillon Simpson. 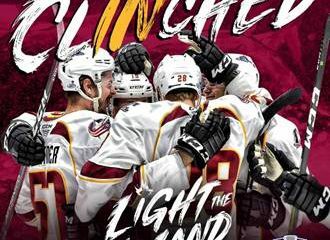 Somerby struck again, this time at four-on-four, courtesy of Adam Clendening and Paul Bittner’s helpers at 32 seconds of the middle stanza before Kevin Stenlund notched an unassisted even-strength tally at 16:25 to make it 3-0 Cleveland. Utica responded prior to the end of the middle period, however, as former Monster Jaime Sifers connected at even-strength at 18:11 to make it 3-1 through 40 minutes of play. The final frame saw the Comets string together three more unanswered goals, from Reid Boucher on the power-play at 9:27, and Bredan Gaunce and Tanner Kero at even-strength at 10:44 and 11:44 respectively, to claim their first lead at 4-3. 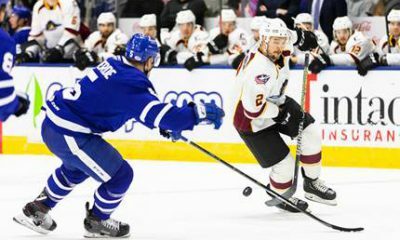 Cleveland’s Sam Vigneault netted a five-on-five equalizer at 13:00 thanks to feeds from Somerby and Simpson to force overtime, but in the extra session, Utica’s Tom Pyatt delivered the Comets a 5-4 win with a decisive three-on-three score at 4:25. Monsters goaltender Jean-Francois Berube stopped 28 of the 33 shots he faced to fall to 16-15-5 this season while Utica’s Michael Leighton improved to 6-2-0 this year by virtue of a 25-save performance. Next up for the Monsters, it’s a Wednesday road clash vs. the Rochester Americans with full coverage, live from Blue Cross Arena in Rochester, NY, underway at 7:00 pm.